Let’s go ahead with learning FOOTGUN. It’s my favourite trick. It has different name around the world : cafetiere, footgun, coffee machine, shoot-the-duck… Each person will have personal facilities or difficulties about performing this trick, but this general method will help. Just spend the time you personally need for each step. Slaloming one foot forward. If not, learn this trick first, starting from the foot gun would not be efficient. First step is about entering the sitting tricks family. Set your 2 feet parallel, Keep your 2 feet on the floor, Flex your leg, Bend your arms forward horizontal, and let your hips go below the level of your knee. Your legs should not wave inside or outside, they should just remain parallel without touching one another. First time you might fall backward. If you do so, balance your arm far ahead, balance your shoulders ahead – they should actually be over your knees, your head should be forward compared to your feet level. If this is still too difficult, hang something heavy while doing this. If this exercise is too easy, let your hips go down until your leg is totally flexed, you can also wear a backpack and try again, or just go ahead next step. This exercise will develop your ankle flexibility. Since your able to do it on shoes, put your skates on. Start with an average speed, drive straight ahead, and repeat this exercise while skating. Remember to wear your wrist guards at first. If you are not comfortable, remember to put your chest on your knee, and balance your weight forward. 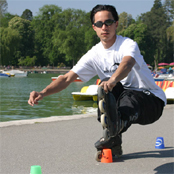 Some skaters also raise their heel by adding some centimetres in between the frame and the heel of the skate shell. If you feel comfortable, you might be able to skate ahead some 20 meters. Let’s go ahead then. At first, the top body is balanced forward, when you feel safe from falling backward, raise it up, remember to bend your leg.. When you feel more comfortable with your balance, start with an average speed, drive straight ahead until your speed is very low : this will help to have the right position. Start with an average speed, set average speed and balance your weight right and left. The skate you hold in your hand will help. Set it right to turn right – left to turn left. This exercise will help to drive your trick the direction you want. Since you can wave, give a try average speed on the 120cm slalom. When you feel comfortable with driving right-left, you feel your “skating” foot (the foot which is currently skating) moving right or left. In this second exercise, the skating foot is turning right – left without balancing aside. The top body remains up and the skating foot is driving the slalom. Put your shoes on. Stand up, bend one leg forward horizontal, hold it with your hand (right foot right hand or left foot left hand). Now flex the other leg until the lowest point, while keeping the first leg horizontal. You need to control your body going down, in order to avoid the fall. When you down, stand up with one leg, while keeping the first leg horizontal. Repeat this exercise 3 times. Put your skates on, and do the same exercise. Drive average speed, bend one leg forward horizontal, hold your skate, and flex your other leg, until you have the footgun position. Stand up again & repeat this exercise 3 times. -> Now you can launch the trick & perform it on the cones.